There are just a couple of tricks to these pancakes. 1. You must whip the egg whites till they are stiff, and 2. whatever you do... do not, DO NOT mix the wet and dry ingredients together until you have stiff egg whites and a pan or griddle hot and ready to cook the pancakes. 3. Don't substitute regular milk for the buttermilk. This recipe made 3 pancakes, perfect for one but easily doubles, triples or quadruples! Heat a non-stick pan or griddle to medium heat. In one bowl mix the egg yoke, buttermilk, oil and vanilla. In another bowl mix all the dry ingredients. Make sure your egg whites are whipped and your pan is ready before mixing the wet ingredients with the dry ingredients. There is a chemical reaction between the wet and dry ingredients that make these light and airy. Next fold in the egg whites. You will still see specks of white, that's okay. I always use non-stick spray just as a precaution on my pan. Pour 1/3 of the batter on your pan, cook for 2-4 minutes until you see bubbles. Flip and cook for another 2-3 minutes on the other side. I used to continuously buy pizza stones that cost $20, only to have them break on me. Then I realized I could buy tiles at the home repair store for only $1.00 that work just as well. You want to buy the tiles that are unglazed. The glaze could have lead that could transfer to your pizza. If you don't have a pizza stone you could still make this recipe on a sheet pan. You could also use those pre-baked store bought pizza crusts. Dust your dough and cutting board with flour. Roll out the dough. To easily slide my pizza on to the pizza stone, I use a cookie sheet that does not have an edge on it. I liberly spread corn meal onto the cookie sheet so the dough doesn't stick then place dough on the corn meal. Shake the cookie sheet back and forth to make sure your dough is not sticking. On the dough, top it with dollups of tomato sauce and fresh mozzarella. 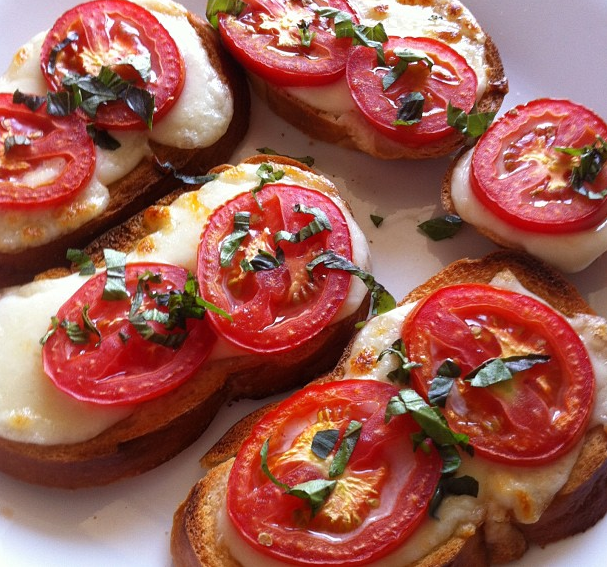 Top the cheese with the tomatoes and sprinkle with salt and pepper. It may look like too many tomatoes, but they will shrink. Slide your pizza on to the pizza stone or place your pizza in the oven to bake if using an sheet pan. Bake for 15-17 minutes. 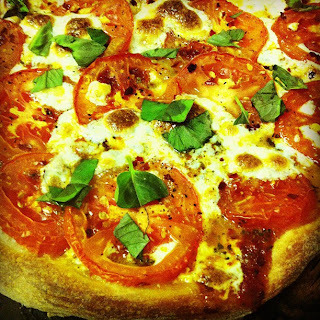 Top your pizza with the fresh basil right when it comes out of the oven.